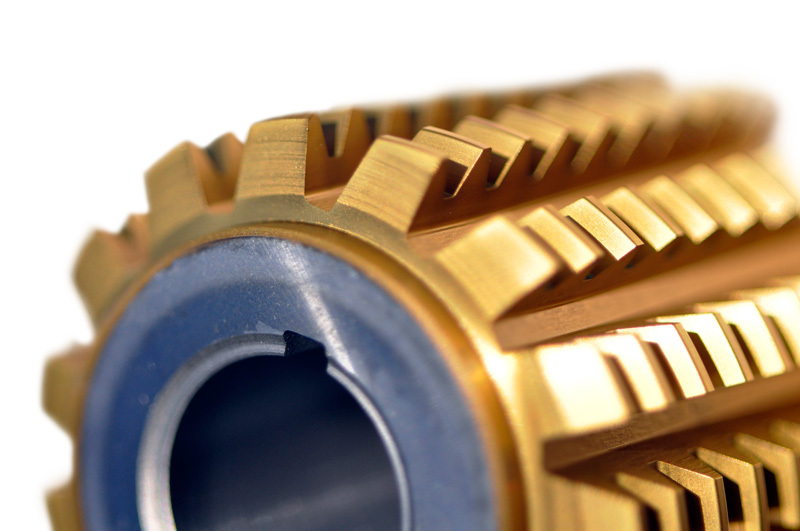 An introduction to coatings and their use for gear cutting tools. In this issue, we will discuss one of the most important aspects of gear cutting tools aside from the tool itself: tool coatings. The most common process through which coatings adhere to tools is called Physical Vapor Deposition (PVD). Before the PVD process, tools are physically and chemically cleaned thoroughly. This ensures no contamination alters the coating and allows a consistent, measurable process. During PVD, the tools become the cathode of a high voltage circuit in a reaction chamber. Argon gas is injected into the chamber to further clean the tools. A metal ingot, usually titanium, is heated with an electron beam until it evaporates. A reactive gas (nitrogen in the case of TiN) is then injected into the chamber and is electrically accelerated toward the tools. The gas combines with the evaporated metal, creating the chemical composition of the coating that adheres to the tools. This process operates within the range of 900°F, which is well below the tempering range of high speed steel (HSS) and keeps the tools from being softened and rehardened. The end result is a tight adhesive bond with a coating that is as thin as 1-4 μm, allowing for sharp edges to be retained. Tool coatings have been available since the 1970s when Titanium Nitride (TiN) was introduced. TiN is still the most popular coating for cutting tools in general, though advances in coating technology allow manufacturers today to choose from many different options and reap a variety of benefits for gear cutting applications. Compared to common cutting tools such as end mills, gear cutting tools are costly, so the choice of coating can provide important cost savings. There are many benefits from coating cutting tools, such as reduced wear on the tool. This is achieved by acting like a non-stick coating. Coatings prevent direct contact of chips with the tool, reduce buildup along the cutting edge, and avoid welding of chips to the tool. Coatings have a high hardness, which prevents abrasive wear on the tool. They also have a lower coefficient of friction than most cutting materials, which reduces heat and wear generated during cutting. The thermal conductivity of coatings is lower than that of cutting materials, which allows heat to be retained in the chip, reducing undue thermal stress on the tool. Together, these attributes can improve tool life by 200–300% and in some applications allow for an increase in speeds and feed rates by as much as 30–50% compared to similar uncoated tools. 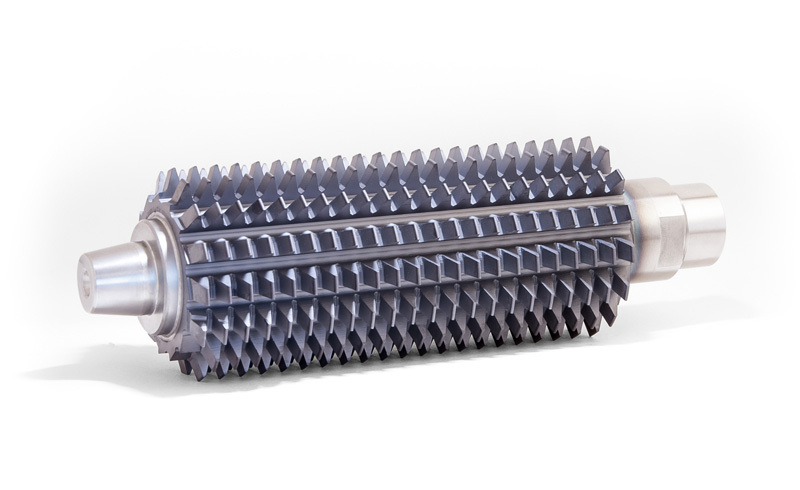 There are three leading coatings that are in use for gear cutting applications today: TiN, Titanium Aluminum-Nitride (TiAlN), and Aluminum Chromium Nitride (AlCrN). All of these coatings can be used in applications which use coolant. Some dry hobbing applications can use TiN, but TiAlN and AlCrN have better success due to their higher maximum service temperature (see table above). These coatings have all-around desirable qualities, with TiAlN and AlCrN being the current forerunners in gear cutting applications. Coating technology is constantly being upgraded and tested, so gear manufacturers should stay in the loop and be cognizant about updates that take place in the coating world. For example, Oerlikon Balzers (a globally prominent coating solution provider) recently announced their newest generation of gear tool coating, which they claim provides significantly increased cutting performance over traditional AlCrN. The correct choice of cutting tool coatings can greatly increase the productivity of gear cutting applications.